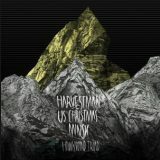 A tribute to the Hawklords, this joint effort from US Christmas, Harvestman and Minsk (all reviewed individually elsewhere on the site) is more of a covers album than the one-large-band thing I initially expected, but doesn’t lose anything for that. As you’d expect from a Neurot release, the psychedelic credentials here are well-established, and all three bands acquit themselves well, honouring the originals but giving their own slant to each. They take it in turns to perform tracks, opening with US Christmas’ take on Master Of The Universe, continuing with Harvestman’s D Rider, and so on. Mostly, the bands are pretty faithful, as mentioned, but there does seem to be an increase in the Stoner Rock elements, particularly from Minsk, whose Jazz-infused cover of 7x7 is one of the heaviest things present, yet drips with hallucinogenic style and is utterly brilliant. If you’re a fan of any of the bands, you’ll find a lot to enjoy, as this kind of experimental music has a common thread which is easy to pick up on and appreciate, and even experienced Hawkwinders will get a kick out of it. Interestingly, Steve von Till’s voice is the biggest standout here, his Harvestman take on The Watcher more Howling Wolf than Hawkwind, and completely freaky and miserable. He sounds nicely Lemmy-like on Down Through The Night, which is even more druggy than the original. Again though, my favourites on this compilation are Minsk, a very underrated band in these parts. You can’t hear their Assault And Battery/The Golden Void without loving it, the band clearly having a blast as they rock the hell out, strange high-pitched wailing melodies and Melvins-esque group singing making it a winner. None of the bands present can be faulted in any way, however, and everyone listening will have their own favourite – US Christmas’ Psychedelic Warlords is great, too, and You Shouldn’t Do That is utterly brilliant, starting with an enjoyable Rockabilly tint before rocking the holy hell out. Ultimately, Hawkwind Triad is one of the better tributes I’ve heard. Hawkwind deserve worship, as I’ve said elsewhere, and by laying this out as an album with its own natural ebb and flow, the three bands involved deserve a lot of credit – it’s utterly listenable, and makes a fine addition to any Space Rocker’s collection, whether they’re au fait with Hawkwind’s entire catalogue or just taking those first steps towards the hall of the mountain grill. Whether you prefer your psychedelic music to rock out or freak out, this is highly recommended.